I really liked these curtains. I had bought two when I was in an apartment with one window, but needed an extra set when I moved into a house. While they are for the outdoors, they looked so lovely with my Madison Park Pacific Grove Coral Cotton Comforter Set. Separate your outdoor space in style, with our Crystal Fretwork 3M Scotchgard panel. 3M Scotchgard treatment provides long lasting protection by repelling moisture, resist staining, and providing a durable water barrier that keeps fabric drier longer. Simply hang to stylishly separate your space, enhance privacy, or filter the right amount of light for comfort. Due to the nature of this fabric, requires washing before use; will soften after wash. Machine washable for easy care. Dimensions 19.0 In. X 12.0 In. X 2.0 In. I actually bought these to use as a combination shower curtain and window treatment for my clawfoot tub so I needed the scotchgard treatment. They work wonderfully for this purpose, although this is a guest bath that is rarely used so I can't say how they'd hold up to daily use. They don't look the same on either side of the fabric, but since they are almost always hung as curtains, it doesn't bother me. I've had these Outdoor curtains for a little over a year. They've held their color pretty well in the persistent Southern California sun. I got them to protect my outdoor furniture which was starting to breakdown in the constant sun. They are doing well for a product that has gone through lots of sun, and in winter, rain. Got these in Navy, long length. They look great and seem durable. They've only been up for a week, so not sure on long term use. It's rained a bit recently, but these have been dry to the touch when the rest of the deck was still wet. Very pleased with purchase and timely shipping. 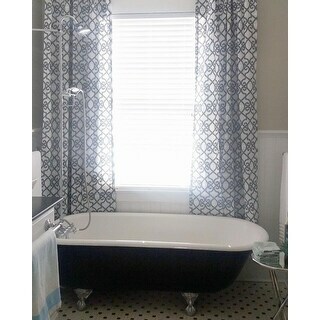 Beautiful curtain, one panel only so order 2. I got the aqua colored ones, there is subtle grey tones in the background with the aqua pattern on top. Nice heavyweight material. 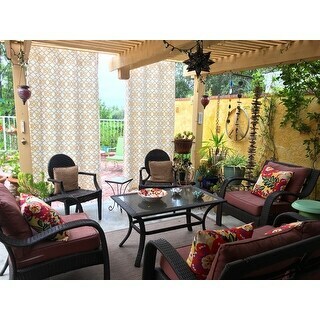 I used these curtain panels to complete my outdoor patio space. Love them! 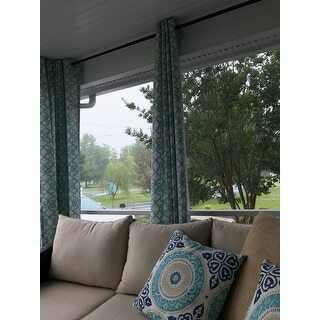 Heavy, outdoor fabric looks great and enhances room. 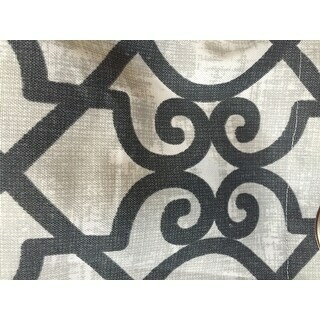 These curtains are a perfect match to my Madison Park comforter set. I love the color, but would have just have liked for them to be a softer fabric. 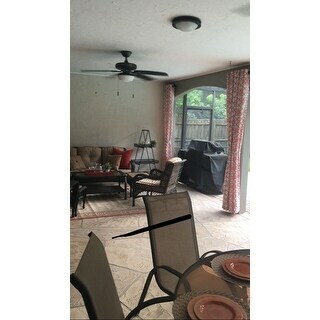 We live in Fl and are redoing our patio/lanai. 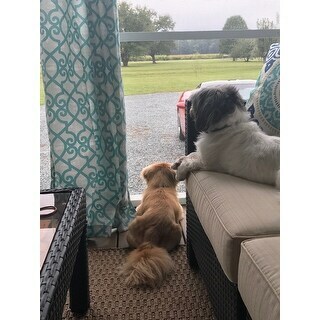 My husband finally got an opportunity to hang the curtains today and they look great. They go well the new concrete floor, table, patio set and area rug ( rug purchased at overstock). We still have some work to do out there, painting etc but wanted to share to show they are not to,orangey or loud. We have four columns , so I purchased 6 panels. Two each for two columns in center and 1 panel for column at each end. I bought 4 small rods 18” and centered over columns in center and also put ones at each end. Small Rods were a pain to find but finally located some on hayneedle. Enjoying the color that these panels bring to our screened porch. 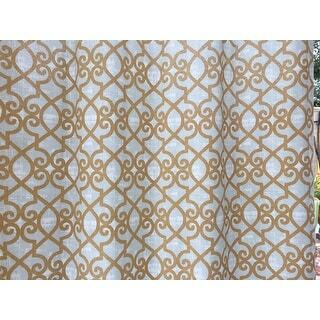 There is a grey/green element to the background that I didn't expect but it blends well for an outdoor curtain. They are holding up well, easy to clean, but faded before the end of the first season. We like it. buy with confidence. 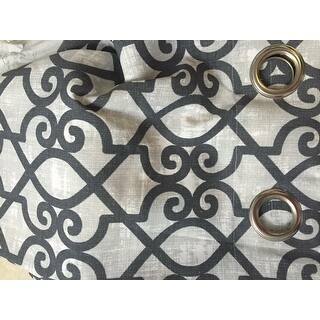 We love these curtains! 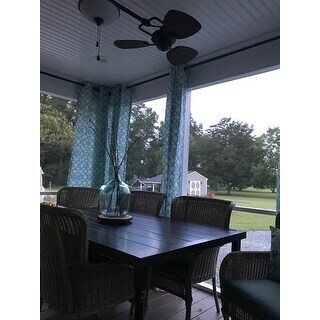 They are very good quality and look perfect on our back porch. I would highly recommend these to anyone. Great addition. Love these curtains! I have had them on my screened porch for @ a year and they are very nice to block afternoon sun. Also are thick/heavy enough to help with cold during winter months. I got them in aqua and are very happy with! Would buy again! "Do these curtains come in set of 2? If not it looks like there are only 2 panels available. I need 4 panels if they don't come in a set." Each panel is sold separately, and we have plenty of them in stock. 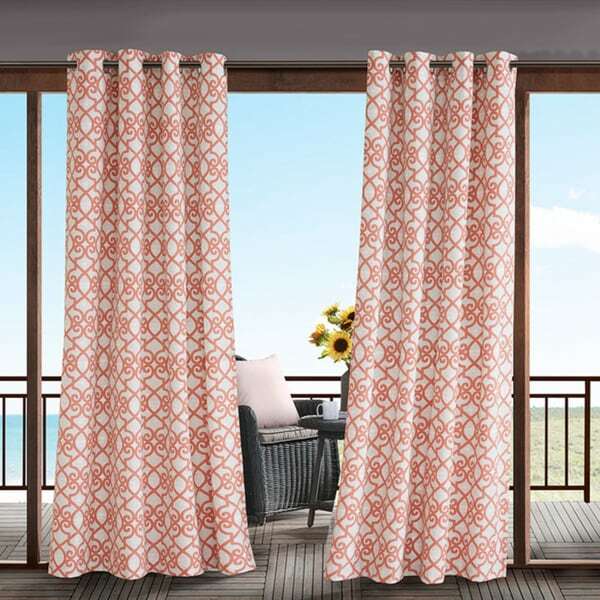 "Is the print on both sides of the curtain panel?" This has the same pattern on both the front and back of the panel. "but is the actual item grey & white? not what is on computer"
This item is currently available in a grey and white option. "are these grey & white or grey & off white?" In my opinion they are grey and white but that may vary depending on your screen or monitor. "can you use these indoors?" This can be used indoors as well.